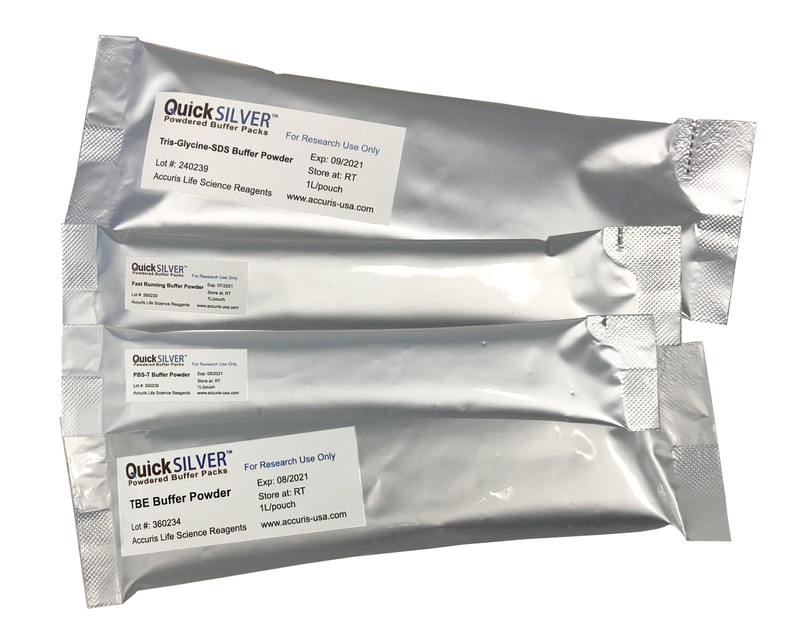 Accuris QuickSilver™ Powdered Buffer Packs … Fresh buffer, when you need it. 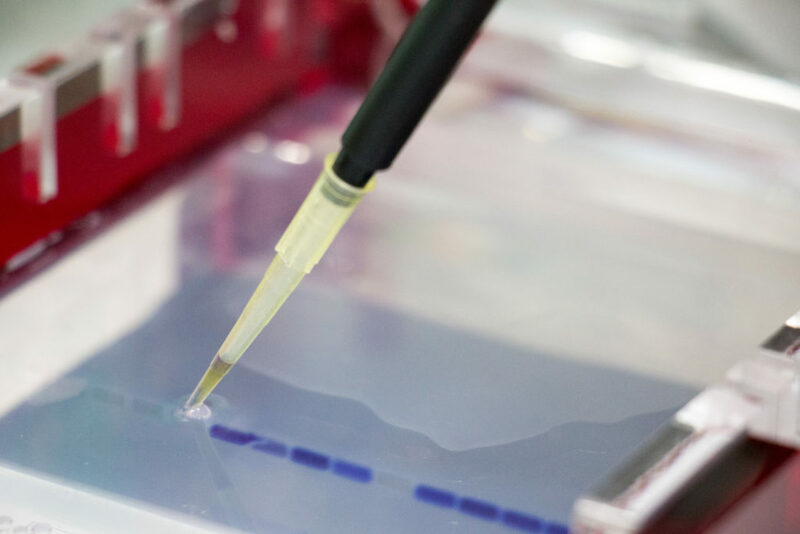 TAE is ideal for separation of large DNA fragments in agarose gels and is used as running buffer and in gel preparation. 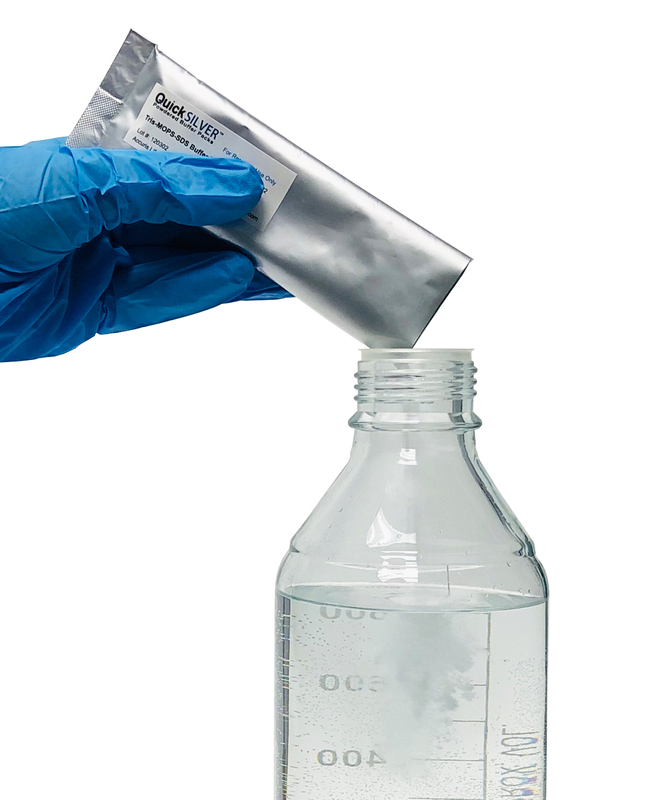 TAE is the buffer of choice when recovering DNA from gels and when downstream processing involves enzymatic reactions. Final concentration of a 1X working solution is 40mM Tris, 20mM acetic acid, 1mM EDTA. 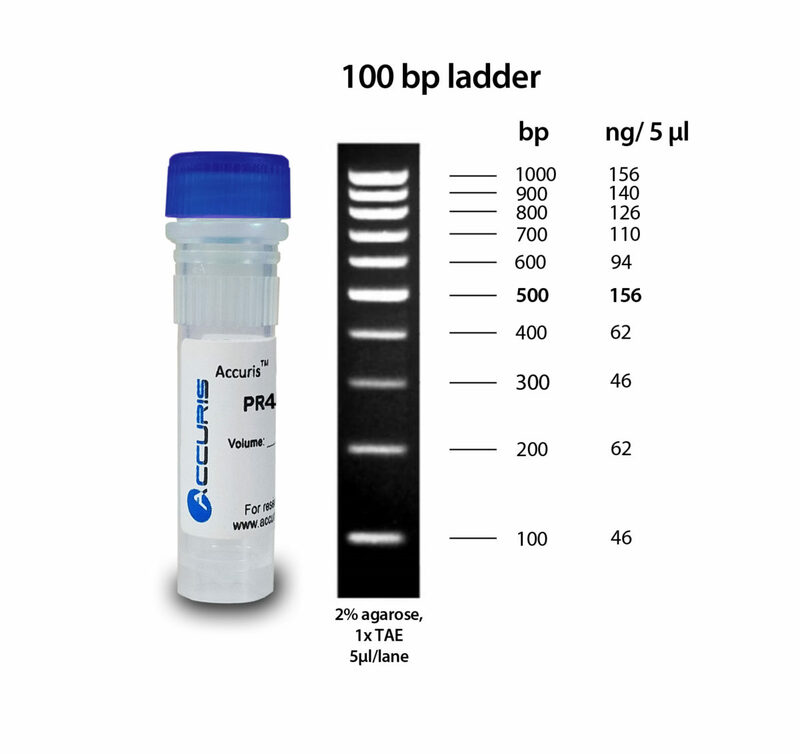 TBE is used in gel preparation and as a running buffer for electrophoresis of nucleic acids. TBE works best for resolution of smaller fragments (<2kb). Its higher buffering capacity makes it useful for longer runs. The final concentration of a 1X working solution is 89mM Tris, 89mM boric acid, 2mM EDTA. 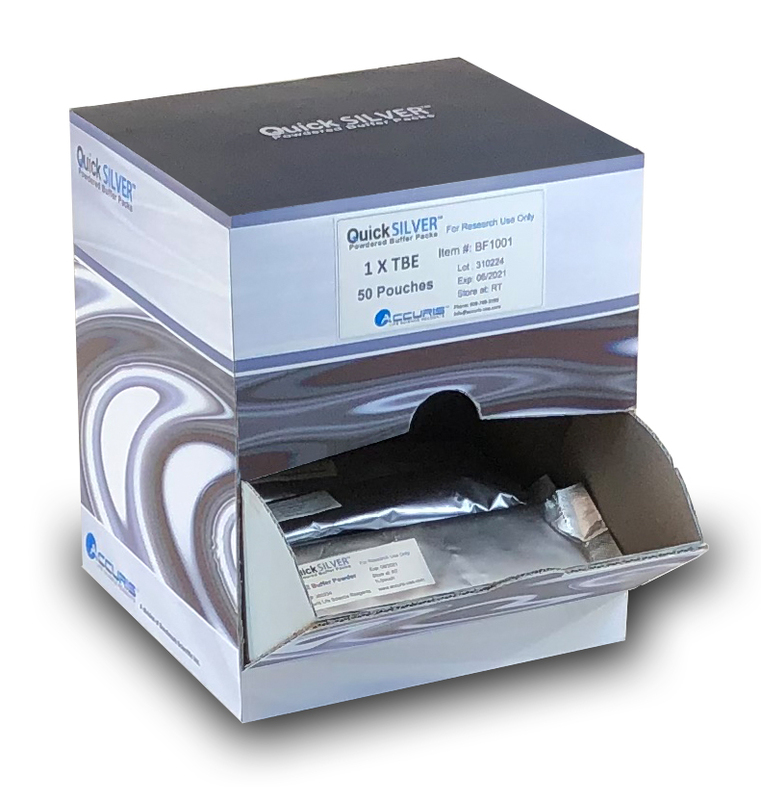 QuickSilver Fast Running Buffer is a proprietary blend formulated for agarose gel electrophoresis at high voltage (300-350V). Its strong buffering capacity minimizes heat generation all allows for extremely fast separation of fragments smaller that 5kb. A typical 30 minute run can be performed in just 10 minutes using this buffer. Tris-Glycine-SDS is one of the most common running buffers used for SDS-PAGE. A 1X solution contains 25mM Tris, 192mM Glycine and 0.1% SDS. 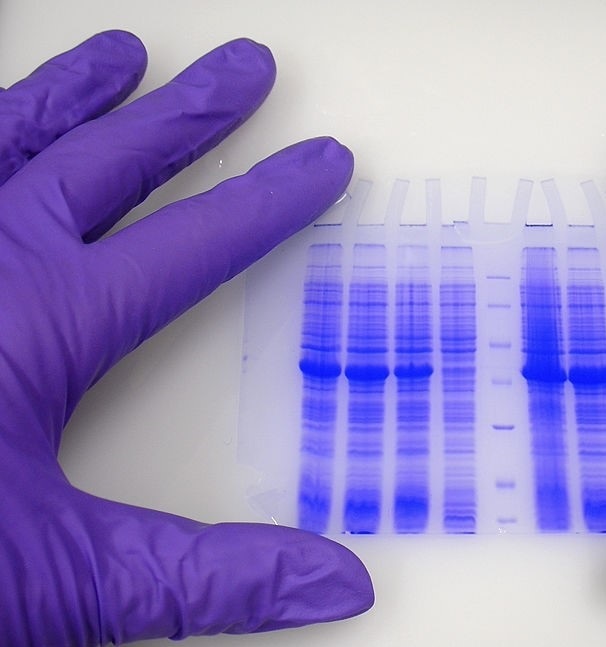 Small to medium molecular weight proteins can be resolved on SDS-PAGE gels using Tris-MES-SDS as a running buffer. Proteins resolve faster in gels using Tris-MES-SDS as a running buffer than those using Tris-MOPS-SDS. 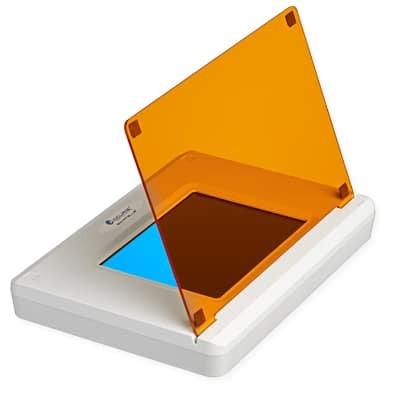 A 1X solution has a final concentration of 50mM Tris, 50mM MES, 0.1% SDS and 1mM EDTA. Tris-MOPS-SDS is ideal for use as a running buffer when resolving medium to large proteins with SDS-PAGE. Gels run with Tris-MOPS-SDS buffer run slower than those using Tris-MES-SDS buffer. The final concentration of a 1X working solution is 50mM Tris, 50mM MOPS, 0.1% SDS and 1mM EDTA. 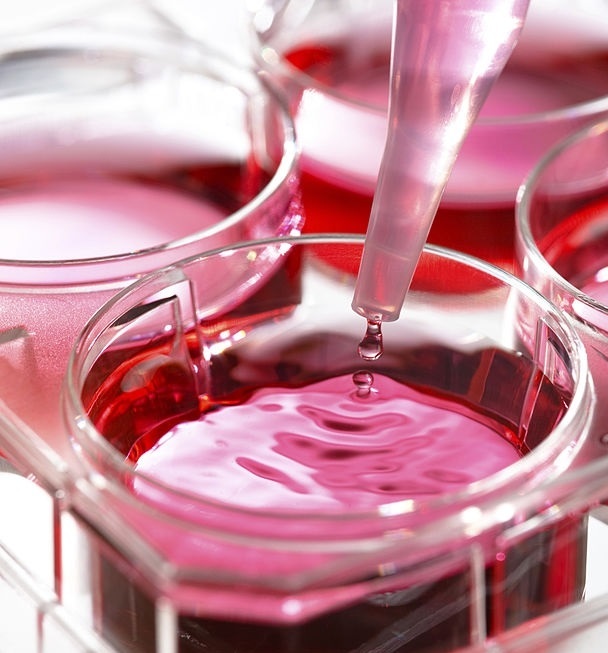 Because its osmolality and ion concentration closely mimic that of the human body, PBS is commonly used for cell culture applications, as well as HPLC and MS. PBST is a wash buffer and diluent for ELISA. The 1X PBS solution contains 137mN NaCl, 2.7mM KCl and 10mM phosphate. PBST is supplemented with 0.05% Tween-20. TBS and TBST are used to maintain pH within a very narrow range for a variety of applications including western blotting and immunoassays. The final concentration of a 1X working solution is 137mM NaCl, 2.7mM KCl, 50mM Tris. In addition, 1X TBST contains 0.1% Tween-20.